As a Corporation owner, you are required by law to follow Corporate Formalities. Some examples of corporate formalities include keeping the Corporation in good standing in the state of incorporation, maintaining the stock ledgers properly, keeping your corporate minutes and corporate resolutions up-to-date. So you've incorporated or formed an LLC. Now what? Incorporating offers the power of liability protection, but the only way the courts enforce that benefit is if you treat the Corporation like a Corporation. Unfortunately, people incorporate and continue to treat the company as if it’s a Sole Proprietorship. Read the 10-most common mistakes. 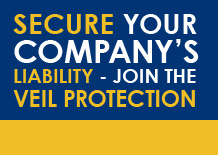 The Corporate Veil Protection Program has helped thousands of business owners. We’ve developed several powerful tools and numerous resources to help you maintain the liability protection your Corporation should provide.